CRM stands for customer relationship management. Sage CRM software helps businesses improve customer relationships by organising and automating communications and activities across all customer-facing departments including sales, marketing and customer service. Sage CRM offers a broad range of functionality with a low total cost of ownership to small and mid-sized organisations globally. Sage CRM equips sales, marketing and customer service teams with the tools they need to boost productivity, find new customers, close sales faster and build lasting, more profitable relationships across all channels. Regardless of how, when or where your customers, partners and prospects choose to interact with your business, Sage CRM provides a distinctive advantage by delivering a comprehensive, easy-to-use and intuitive system to successfully manage these relationships. Additionally, Sage CRM connects your business like no other CRM application. Out-of-the-box it delivers tight integration with leading Sage ERP applications, breaking down departmental silos, connecting your front- and back-office and providing total visibility and control right across your business through the interactive dashboard. 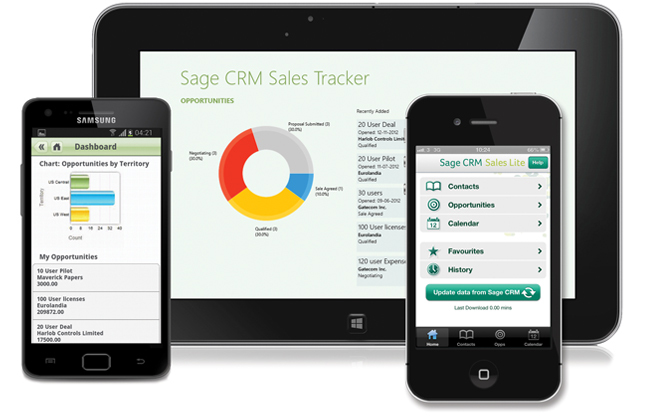 Sage CRM’s interactive dashboard revolutionises the way you manage your business. Information and feeds from within Sage CRM, external websites and integrated Sage ERP systems are all displayed in real-time on a single workspace so users have all the information they need at their fingertips. It eliminates the need to switch screens, driving productivity and ensuring the most efficient use of staff time. Through its powerful workflow engine, Sage CRM drives organisation-wide, straight-through business process automation. Thanks to its ERP integration capabilities, Sage CRM delivers a 360 degree view of both customers and the business across the front- and back-office to enable deeper customer and business performance insight. Due to its open architecture and web services interface, Sage CRM also enables easy integration with other business applications and on-demand services, making it more relevant to your business and delivering better business management.